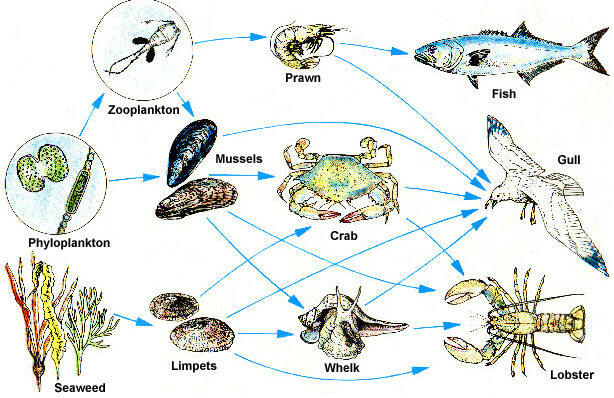 If we look at the simple food web to the right, we can see 5 food chains. 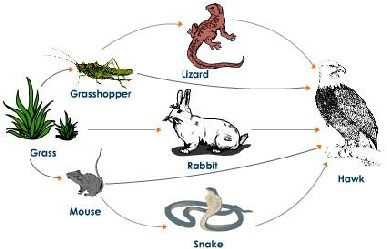 You’ll notice that the Grasshopper, Lizard, Rabbit, and snake all have just one predator, while the mouse has 2. Even the smallest change in an ecosystem can have serious consequences. If we remove a top predator, then its prey will multiply and the population will grow. Meaning there is more pressure on the producers. Eventually they will run out, possibly causing the death of the organisms. If we remove the insects from this food web, the result will be an increase in slug and rabbit populations, since they have less competition for the grass. However, Vole and Frog populations will decrease because there is less food for them. Fox and Hawk population would probably stay the same, since rabbit and thrush populations would increase. In the animation to the right, the orange bar represents population amounts. Tree, Mouse, Hawk, Lizard, Grasshopper, Rabbit, Snake.